Sam - One of the great things about origami is, it is capable of very complex structures. Theoretically, origami can produce almost anything that you could want to use. Graihagh - So, what have you designed and built? 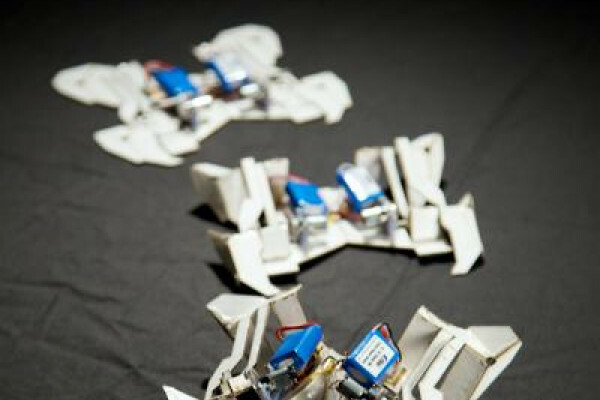 Sam - So, we've built a self-folding crawling robot that can fold itself completely autonomously. It starts off looking like a roughly rectangular flat sheet, almost like the outline of a robot. And then once it fold itself, it looks more like the origami pattern of a bug or a crab. Graihagh - Why? What was the inspiration behind your design? Sam - So, we're originally interested in making robots that were as cheap and quick to build as possible. We call this principle manufacturing - the idea is that you could make a robot as easily as you could print a Word document. We started by looking at origami because origami can produce a wide range of structures and devices. But at the same time, producing flat sheets is very inexpensive. And so, you can print your inexpensive flat sheet and then fold it up into the desired machine. However, we found the limiting factor here, was the time it took to actually fold these machines into place. For our experienced users, it will take about an hour for our first robotic designs to be folded up. So, we wanted to find a way to automate that process and make robots fold themselves. Graihagh - How long did they take to fold? Sam - This robot takes 4 minutes to fold. Graihagh - And how exactly does it work? How does it fold? Sam - So, along each fold, we have what's called a hinge. The entire composite consists of two layers of shape memory polymers, which is sold as a child's toy called 'shrinky dinks'. And this toy, once heated to a certain temperature, about 200 degrees farenheit or 100 degrees Celsius shrinks by 50% and we bond this to two sheets of paper. So, when the shape memory polymer shrinks, it pulls on the paper, causing it to fold over at these hinges. And we trigger this folding through heated resistive circuits and we supply these circuits with electricity. It heats up that area, causing the shape memory polymer to shrink and pull along the paper, causing it to fold. Graihagh - So, when it's heated, it shrinks. Does that mean you end up with a robot that's much, much smaller than when you first started out? Sam - Not quite. So, the natural mechanism of this shape memory polymer is to shrink, but once we bond it to the paper, it keeps it from shrinking completely. Instead what it does is pull on it, almost similar to your muscle in your arm. The muscle itself only shrinks, but because it's attached to two sides, your forearm and your upper arm, it causes the whole arm to bend instead. Graihagh - What uses could it have in the future? Sam - In addition to our idea of making robots quickly and cheaply, there's a lot of opportunities for building things where humans can't go. We could use it for building structures in disaster zones or sending in rescue robots. Personally, I like the idea of sending up a ream of flat sheets into space where they could turn themselves into satellites. Graihagh - So, what's the next generation of these origami robots? What are they going to look like? Sam - Well, we're trying to do two things and effectively, expand the range of what we can build, both changing the geometries and the scales, as well as changing how we create the self-folding. On the scales, I'll actually be presenting in a couple of weeks, unfolding simple objects that are ten times as small. At that scale, there's a whole different set of challenges but we use different materials. Instead of paper, we use aluminium and instead of 'shrinky dinks', we use heat shrink wrap, just like the kind you'd find in a supermarket. Graihagh - And why are you trying to build something smaller and smaller, and smaller? Do you have an application in mind? Sam - Well practically, we think it might be useful for building tiny robots. We've actually done other folding-inspired research before in our lab. We called it pop-up book MEMS where we could build centimetre-scale robots from multiple sheets that pop-up into their final form. And so, I think we can combine self-folding with these pop-up geometries. But it's also an academic question because, theoretically, origami can fold anything. But what does that mean practically? Can we actually create things that self-fold into anything? Graihagh - And - can you? Sam - Well, we're working on it, but it's getting better and better everyday. Previous Video games: good or bad?